Why wash motor vehicles, equipment and machinery ? Modern vehicles/equipment are operated in some pretty harsh environments and are subjected to a continual bombardment of potentially abrasive and corrosive elements. On the road, insects and bird droppings can land on the paint. In the winter, road and highway maintenance drenches your paint with a caustic salt solution. While summer may bring fresh hot tar that can stick to paint. Even while safely parked, dust, acid rain, pollen and bird droppings quickly adhere to the paint. Over time, these contaminants can chemically etch the surface, leaving permanent paint damage. 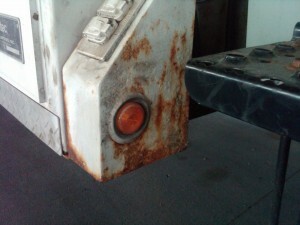 Even plain old dirt eventually scratches the finish, while excessive road salt can lead to early corrosion. To prevent these types of damage, vehicles/equipment need to be washed on a regular basis. WestChem offers a line of world leading transport, fleet and automotive washing products. Material Safety and Tech Data Sheet available upon request.